Bitten by Witch Fever: Wallpaper & Arsenic in the Nineteenth-Century Home comes out on October 11. Just in time to spend a few nice chilly autumn evenings in front of my fireplace, wine glass at my side, devouring the morbid content. The author is Lucinda Hawksley, author of many non-fiction history books on Charles Dickens, the Pre-Raphaelites and their tragic models, and one on Princess Louise, Queen Victoria's rebellious daughter. In Germany, in 1814, Wilhelm Sattler created an extremely toxic arsenic and verdigris compound pigment, Schweinfurt green – known also as Paris, Vienna, or emerald green – which became an instant favorite amongst designers and manufacturers the world over, thanks to its versatility in creating enduring yellows, vivid greens, and brilliant blues. Most insidiously, the arsenic-laced pigment made its way into intricately patterned, brightly colored wallpapers and from there, as they became increasingly in vogue, into the Victorian home. As its use became widespread, commercial arsenic mines increased production to meet the near-insatiable demand. Not least of which was the UK’s largest mining plant, DGC, whose owner was William Morris, originator of the British Arts and Crafts movement and arguably the finest wallpaper designer of his generation. Bitten by Witch Fever (Morris’s own phrase to dismiss arsenic - and wall-paper-related public health concerns in 1885) tells this fatal story of Victorian home décor, building upon new research conducted especially for this book by the British National Archive, on their own samples. Spliced between the sections of text are stunning facsimiles of the wallpapers themselves. I certainly hope the author of the book doesn't use so many long run-on sentences as the publishers did! Anyway, i'm intrigued to see the photos of the vintage wallpapers! Publishers Weekly reviewed this book a couple of days ago, writing that "The book is lovely, with 275 stunning wallpapers spliced into an intriguing narrative about the lore of arsenic, often called the poison of kings." 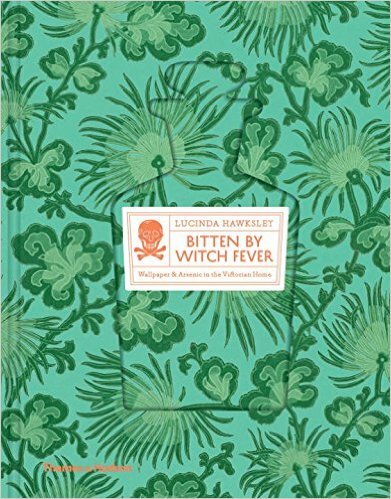 Booktopia's review calls it "Beautiful to look at and compelling to read, Bitten by Witch Fever is a highly original and captivating volume that interleaves facsimile sections of alluring, arsenic-laden wallpapers with thought-provoking narrative." Do you enjoy non-fiction books? Does this one intrigue you at all? Let me know in the comments section below.